Preheat oven to 400. Line a baking tray with parchment paper and set aside. Mix eggs, vanilla and buttermilk together until fully combined. Set aside. Place flour, baking powder, sugar, salt, and zest into a large mixing bowl. Stir together using fork or wooden spoon. Add in butter and cut into flour mixture using a pastry blender or your fork until mixer resembles coarse crumbs. Add egg mixture and mix until just combined. Turned out dough onto floured surface and knead until it comes together about 15 times. Add more flour as necessary to prevent sticking. Pat or roll dough into a 12 inch found circle and cut into wedges. Place each wedge of dough onto prepared baking sheet. 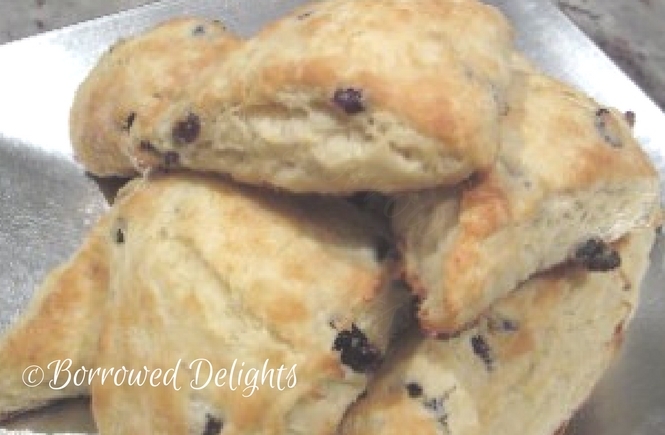 Bake scones for 10 minutes. Remove from baking tray and allow to cool on cooling rack.